Preheat the oven to 180°C/350°F; Butter a 21cm (8½ in) fluted round tart pan* (with a removable bottom) and place it on a baking sheet. Sift the all purpose flour, baking powder, salt, cinnamon and nutmeg into a small bowl. Set aside. Cream the butter in a large bowl of a freestanding electric mixer on moderate speed for 2 minutes. Add the granulated sugar and beat for 1-2 minutes. Blend in the egg yolks and vanilla extract. Scrape down the sides of the bowl with a rubber spatula to keep the mixture even-textured. Blend in the almond flour. On low speed, add the sifted mixture in two additions, beating until the dough comes together in large and small curds. Remove the bowl from the stand. With a rubber spatula, work the mixture until it comes together in a dough, pressing sections together. Using your hands, lightly knead the dough on a work surface for 1 minute – the dough should be buttery and firm, but workable. Divide the dough into 2 equal portions. Lightly form each portion into a rounded cake. Roll one portion of dough between two sheets of baking paper to a round about 24cm (9½ in) in diameter. Place the dough (still between the paper sheets) on a cookie sheet and freeze for 5-10 minutes while you work with the other portion of dough. Roll out the remaining dough between sheets of baking paper to a round measuring about 23cm (9in) in diameter. Peel off the top sheet of paper and invert the dough disk onto the tart pan. Peel off the second sheet of paper. Lightly press the dough onto the bottom and sides of the tart pan. Combine the apricot preserves and vanilla extract in a small bowl. Spoon the preserves on the layer of dough and spread on the bottom with a small offset palette knife. Remove the dough from the freezer and peel off the top sheet of paper. 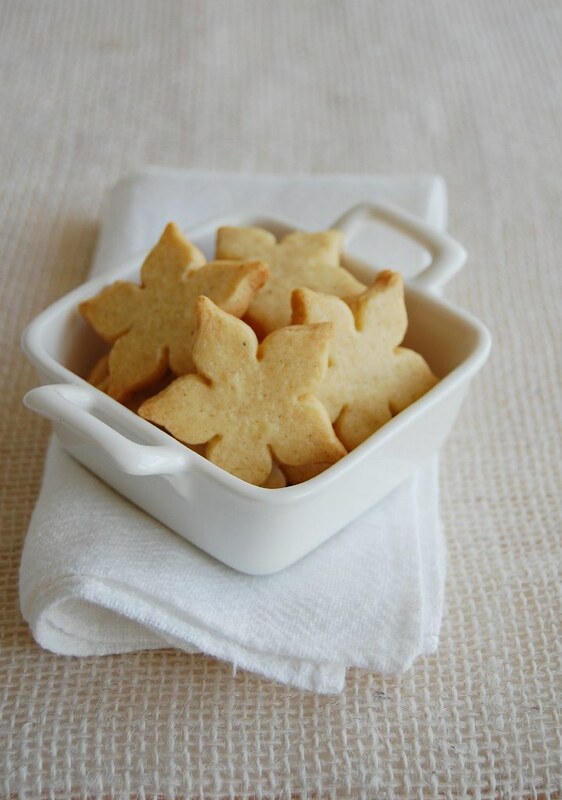 Using a 3.75cm (1½ in) cookie cutter (such as a heart cutter), stamp out 33 pieces of dough as close as possible to each other**. Place the cut outs around the perimeter of the tart (the edge of the dough), then follow with a second ring of cut outs in the middle of the tart, and finally fill in the center with 3 cut outs. Overlap the remaining cut outs attractively in the middle. 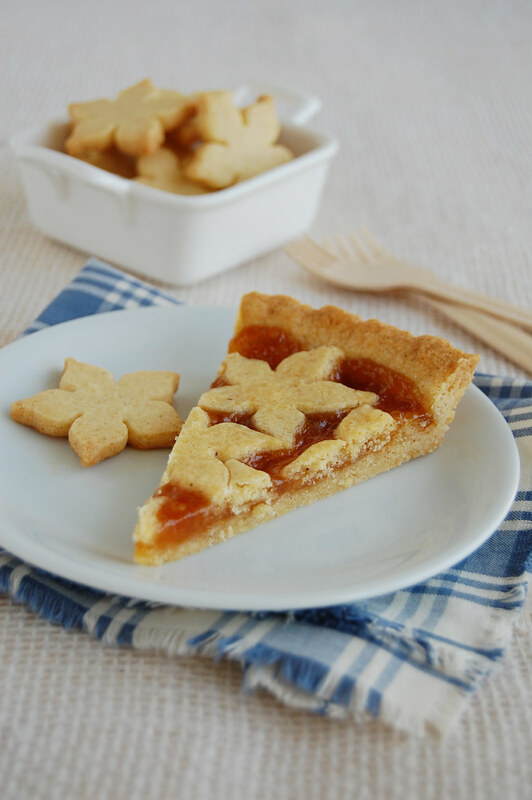 Place the tart on the cookie sheet and bake for 40 minutes or until the apricot filling is bubbly and the cut outs are golden. The tart must be fully baked and golden or it will be pasty textured in the center. Carefully transfer the tart pan to a cooling rack. Cool completely. Carefully unmold and serve cut into wedges. It's rainy here in Malaysia too. Love apricot preserves and anything else that uses it. That is so pretty, and you get some cookies as a bonus too! Love the memories from when you were 7! what a great little tribute with this GORGEOUS tart! so perfect! truly perfect! the photo is perfect, the memory is heart warming and i could eat the tart off the page! you're amazing! This tarte is gorgeus, I love the decoration on top. Ps: did you see the champion's league final? happy days for inter milan! A beautiful tart. It makes me homesick. We had an enormous apricot tree in our back garden and had lots of apricot tarts. Paula, thank you! I love the idea of using blackberry jam, it's delicious! College Baker, it's really good to remember those days, sometimes. I'm glad you liked the tart - thank you! Suelle, thank you! Cookies are always a good thing. Susan, thank you, darling! You are too sweet! M., food can really take us back, don't you think? Thank you, dearie! I love the idea of using plum jam, that must be delicious. Katie, thank you! The original recipe called for heart-shaped cut outs. What a beautiful and creative way to top that tart. Just lovely. Hello, I saw your beautiful tart on TS and thought it was clever the way you had decorated the top of the tart with cookie cutouts... noted that you are a Martin Scorsese fan - you must have watched Shutter Island already -I thought it was brilliant-especially the ending. 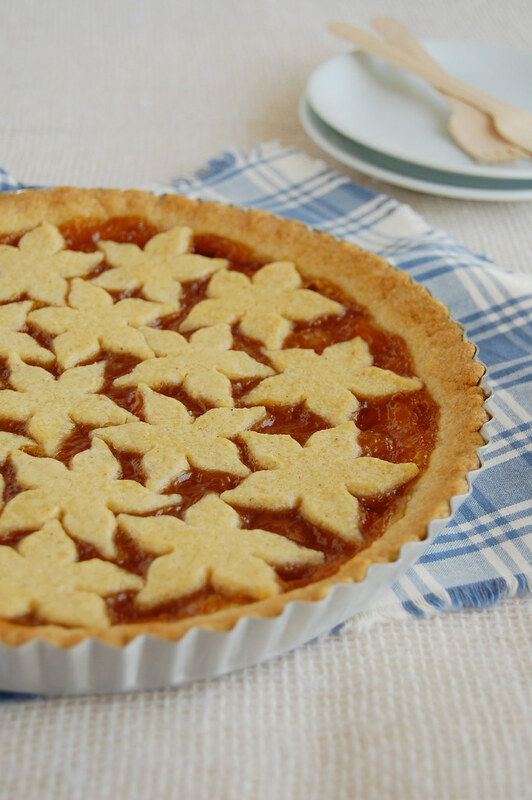 The cutouts are beautiful and the whole tart just exudes the sense of autumn. Just wanted to let you know that I followed this recipe exactly and it came out perfectly. I am relatively new to baking and found this recipe extremely easy to follow and it came out better than i expected. My roommates love it and I can't wait to try different variations with different jams - I hope to try and make some myself! I also made your spiced chocolate mousse which also came out perfect. I love your blog! Thanks for making me a star baker! Susan, hope you like it, sweetie! Shirley, I did and loved the movie! Avi, that is such great news! I'm so happy to hear that - thank YOU for letting me know how the recipes turned out for you!